Hunters can be creatures of sheep-like habits, relying far too much on anecdotal evidence which is no competent evidence at all. We also like to place far, far too much value on our personal experiences. A tragic example of that is poacher John Taylor, and his antique and severely misguided "Taylor Knock-Out Value." Prolific poacher "Pondoro" had his mind made up before his TKO values were constructed. Setting aside science and common sense, Taylor promogulated peculiar, unfounded theories that still persist to this day. Poaching may be accoladed in some circles, but it seems unlikely to gain a Nobel prize anytime soon. Totally ignored was the work of Emil Theodore Kocher (and many others). Awarded Chair of Surgery at the University of Berne in 1875, Kocher contributed extensively in general surgery, gastro-intestinal and endocrine surgery, urology, gynecology, neurosurgery, trauma, and war-related surgery, all compiled in his Textbook of Operative Surgery, first edited in 1892. Due to his technique, Kocher decreased the morbidity and operative mortality in elective thyroid surgery to a very low percentage and described surgical hypothyroidism. Kocher was the first elected president of the International Surgical Society and was awarded the Nobel Prize in 1909 for his work in the physiology, pathology, and surgery on the thyroid gland. As time goes on, the more learned of us such as battlefield surgeon Martin Fackler, MD, one of the world's most respected wounding experts, have recognized that Kocher was more right than perhaps ever acknowledged previously. Most of our information comes from ad-copy that touts fundamentally flawed numbers, suggesting that energy transfer is a goal, and quoting energy numbers and recommended minimums that, if accepted, would have you believe that an arrow could not possibly kill anything, much less ethically. Reading the obituary pages may not be anyone's idea of pleasurable reading, but when was the last time that cause of death was listed as "Kinetic Energy?" Surely in the combined annals of recent history this accepted cause of instant demise must be at least hinted at in obituaries and autopsies? Of course it isn't, with far more historically popular listed causes of death being such maladies as "consumption." In lieu of flowers, perhaps we should ask that donations be sent to the Kinetic Energy Foundation Chapter near you? Kinetic energy is a poor basis for anything specific, as is velocity alone, mass alone, or any number. If a energy number of an object striking soil is known, can you fathom the depth of the crater? 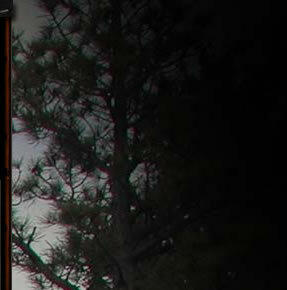 Can you look at the carcass of a game animal, and possibly determine what energy was "transferred" into it? Ironically, "high energy" projectiles have left wounds on the battlefields that need no surgery at all; no excision of tissue. Dr. Fackler has offered some wound profiles that should be far more revealing than just numbers. The wound profile was developed at the Letterman Army Institute of Research in order to measure the amount, type, and location of tissue disruption produced by a given projectile, and to present the data in a standardized, easy to understand picture. "The entire missile path is captured in one or more 25 x 25 x 50 cm blocks of 10% ordnance gelatin at 4°C. The penetration depth, projectile deformation and fragmentation pattern, yaw, and temporary cavity of the missile in living anesthetized swine tissue are reproduced by this gelatin. Measurements are taken from cut sections of the blocks after mapping of the fragmentation pattern with biplaner x-rays. 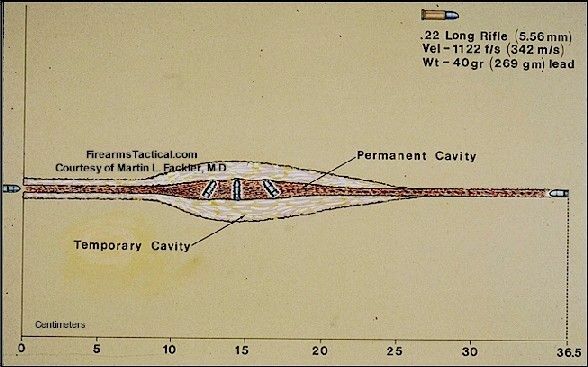 These data are then reproduced on a life sized wound profile which includes a scale to facilitate measurement of tissue disruption dimensions, a drawing of the loaded cartridge case before firing, the bullet weight and morphology before and after firing (and calculated percent of fragmentation), and the striking velocity." I've taken the liberty of adding the Taylor Knock-Out Formula values and the kinetic energy values after each wound profile so you can compare. The Foster type rifled slug has a KE value of 2222 fpe. The TKO value (using .70 caliber) is 66.12. This .22 Long Rifle round (that actually outpenetrates a 12 ga. slug) has a KE value of 112 fpe. The TKO value is 1.43. The .223 Remington has a KE value of 1102 fpe. The TKO value is 5.04. The 30-30 has a KE value of 1536 fpe. The TKO value is 14.7. The .308 (2923 fps, 150 gr.) has a KE value of 2846 fpe. The TKO value is 18.79. The horrific error in putting your faith in either kinetic energy or a Taylor Knock-Out value should be obvious. If you believe in TKO, a 12 gauge Foster slug is 13 times more deadly than a .223 Remington, almost four and one half times as lethal as a 30-30, and over 350% more deadly than a .308. Does anyone believe that? The fpe value is just as bad, if not worse. It would automatically lead you to believe the Foster slug is far superior to a 30-30. It would also characterize the .22 LR rimfire as worthless, though it outpenetrates our .223 Remington round, our 12 gauge Foster slug, and remains the most popular, successfully used mob assassination cartridge of all time. 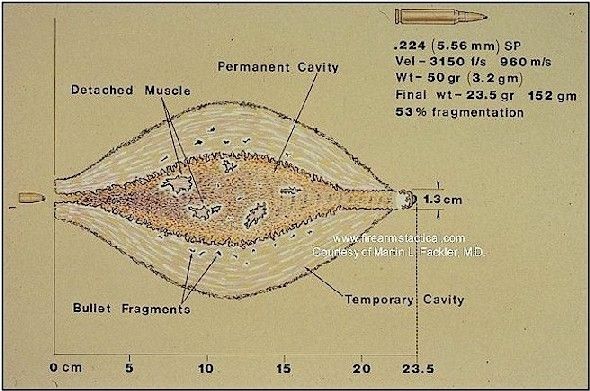 The wounding ballistics show that the destruction of tissue by the .308 dwarfs the rest of the pack, and that the load that offers the best penetration of the bunch is the ancient 30-30. These are strike velocities, and the wound profiles produced. 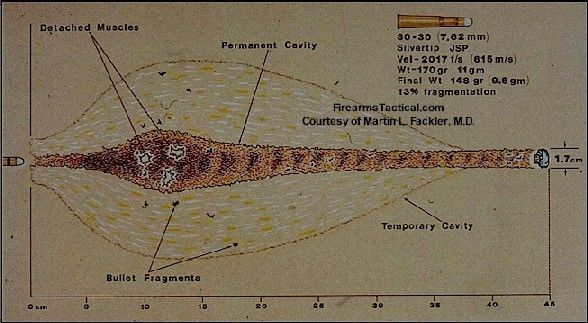 It is easy to fall into the trap of confusing trajectory with lethality, and accuracy with projectile wound profiles. Wounding ballistics profiles have nothing to do with either. Miss what you are shooting at with all of the above, and the results are quite predictably identical. A look at the 30-30 profile illuminates the great peril of glorification of the "temporary" wound cavity. Use of newspapers, clay, and other artificial tissue simulants inaccurately depict the temporary cavity, ignoring the tremendous elasticity of living tissue. By observing this, would quite wrongly be led to believe that the 30-30 is far, far better at tissue destruction than it really is. The best penetration, a massive temporary wound cavity, and excellent weight retention are features of the 30-30 that sound as if it is the best of the bunch. That's hardly the case, either. It goes to show that the wounding dynamic of a specific cartridge and projectile is impossible to properly define in terms of just energy, penetration, shooting into dead newsprint, much less the inane TKO value. Hunters are still in the dark ages, in large measure, about what the specific wounding possibilities for a specific application really are. Perhaps, with a more scientific approach to things as set forth by Dr. Fackler and Dr. Kocher before him, we can achieve more meaningful approaches to our hunting tool selections rather than just "good for CXP2 class game," the latest in a long string of tragic inadequacies. 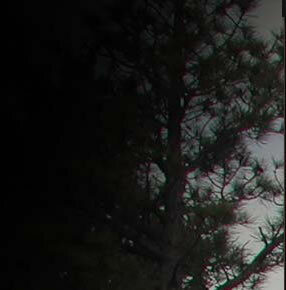 The relatively modern broadhead arrow, with less KE than a .22 Short (50 fpe) has been used to kill all species of game. As Dr. Fackler wrote in 1987, "It is difficult to be optimistic for the future when these weapons developers still use the scientifically discredited "kinetic energy deposit" method to estimate wounding effects." The idolatry of velocity alone greatly misleads, and kinetic energy deposit has been clinically disproved. Yet muzzle velocity and energy are still used today as the most common guides to attempting to predict wounding performance. Duncan MacPherson's book, Bullet Penetration, makes it quite clear that damage is done by stress, not energy. Stresses cause damage only if they strain body tissues above their elastic limits. 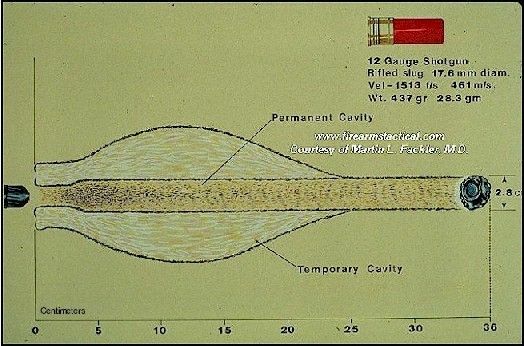 Kinetic energy that is used to produce temporary cavities is largely a waste; the wound profiles above by Dr. Fackler illustrate the extent of it in a few specific cases. The limitations of tissue simulates (newspaper, water, gelatin) should be obvious-no circulation, no compressibility as found in living tissue, no possible way to show bullet interaction with bone, cartilage, sinew, or animal hide. Plastic bullet tips do not and cannot possibly help expansion, but that little fact seems to be lost in favor of prettier bullets. Unfortunately, penetration tests conducted by many manufacturers involve the firing of only one bullet-- the potential margin of error is obvious; the shortcoming of what they are firing into equally so. Information presented by Dr. Fackler is a great step forward; yet as shown here it is a two dimensional look at a three dimensional event. Hunters seem impressed with several of the wrong things, for example the size of an entrance hole and the exit hole-- neither of which are lethal, or can possibly begin to portray the extent of internal tissue destruction. There is a bit of the "collector syndrome" in most of us-- yet, a recovered bullet alone cannot possibly designate wounding ballistics or define a permanent wound channel. Despite the tens of millions of game animals killed every year, the lack of competent actual wounding profile data remains appalling. We do know a few things, however, that are not subject to much speculation or derision. We know that a bullet that expands is better than one that does not-- but only if it does not result in inadequate penetration. We know that bullet mass is important, but only in the sense that it can offer a better wound profile meaning a larger, more effective permanent wound cavity. We do know that velocity plays a role, but again only in the sense that it can offer a better wound profile as well. Most components of wounding ballistics work in concert-- any standalone number value is meaningless, or worse. Bullet mass reduces velocity; higher velocity necessarily reduces projectile mass from hunting rifles that can be shoulder-fired. The two can work against each other. Expansion creates a larger permanent wound channel, but also may reduce penetration. 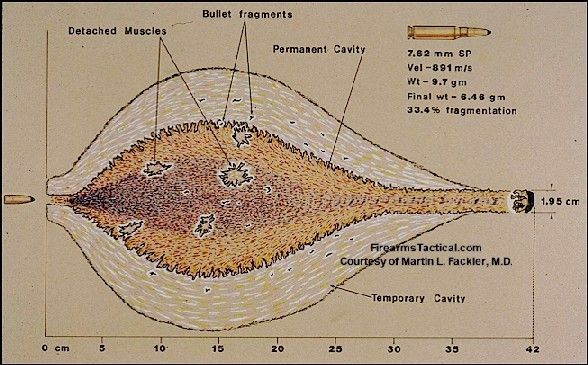 Bullet fragmentation can cause tremendously explosive wound profiles (such as the .223 Remington example above), but that also can severely reduce penetration. The .220 Swift, while causing some observed "lightning-bolt" drops on big game, often caused lost animals as well-- a fact not so gleefully reported. It never should have been considered a big game cartridge in the first place. It still serves as a reminder that velocity worship alone is misguided. Light for caliber bullets are among the worst terminal performers-- the roundball being the absolute worst. We learned that prior to (and while) killing ourselves in the Civil War, where the Capt. Minie ball (attributed to W.W. Greener) was heralded as the greatest advance in firearms history at that time. Thanks to the human races continued proclivity towards killing off parts of itself, we know that FPE is a myopic, wrongful way of describing projectile effectiveness. How much kinetic energy does it take to stick a knife or spear between the ribs of a game animal? 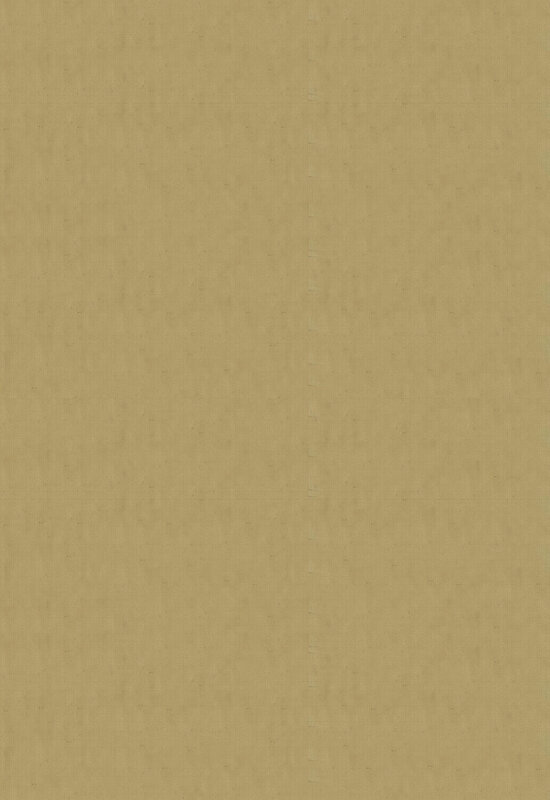 KE values alone designate nothing specifically. Dr. Fackler's call for more and better testing evaluation and testing over the last several decades has gone largely unheeded; doubly so in the sporting community where this expensive undertaking does not mesh well with the "if it doesn't make dollars, it doesn't make sense" directive. Fortunately for hunters, the greatest gun-writer that has ever lived, Jack O'Connor, spent his long career confusing the issue with common sense. The co-mingled common sense, study, research, and very perceptive field observations all combined to make the O'Connor contributions those of lasting value. Reason is the river that permeates his prolific writings, with the concepts of suitability and adequateness defined so well that they have not just endured the test of time; time has elevated them. Reasonable handling / shootability, reasonable field accuracy, reasonable caliber for application, reasonable recoil, reasonable sectional density, reasonable expansion, reasonable bullet weight, reasonable sectional density, reasonable shot placement, reasonable ranges, reasonable penetration, and reasonable expectations lit his prolific prose. While we can all hope for better, more reliable wounding ballistics information in the future-- the spectacular concept of adequacy and common sense will have to do for now. And yes: I sure think Dr. Fackler and the late Jack O'Connor are refreshingly reasonable in their abilities to glean useful real-world information. We are all far better off for their efforts.